The story of Magda Brown is a sad, tragic, but most importantly, inspiring story. As one of the rare and lucky survivors of the mass genocide known as the Holocaust of World War II, she managed to break through all the hardcomings. Magda Brown grew up as a happy child, raised in a loving, religious home in Hungary. 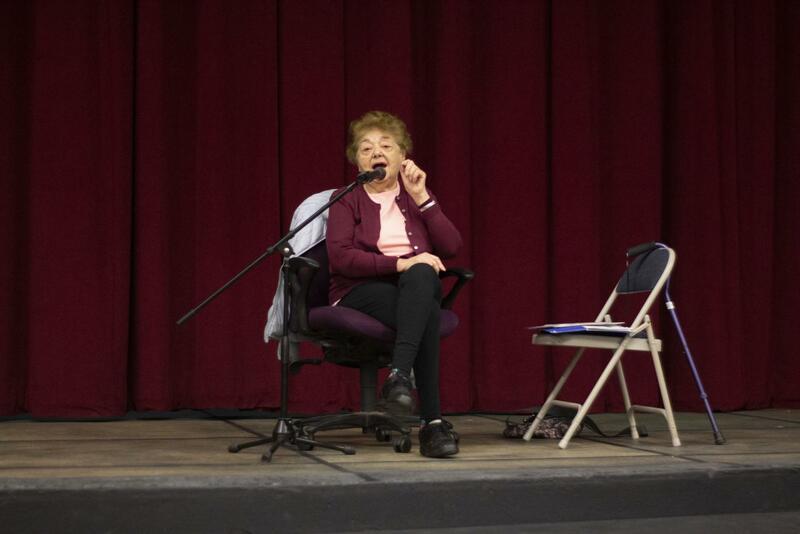 Before the Holocaust, she hoped go to higher education and study to be a radio announcer (radio was relatively new at that time) but an anti-semitic law prevented her from being able to pursue that field. Only about 1 percent of Jewish children were admitted, and even though her grades were good and her father could pay for the tuition, she was still rejected. It was the first sign of discrimination she encountered. The Nazis occupied Hungary on March 19, 1994. In the time of about one week, almost all Jews were displaced from their homes and sent to ghettos with a small bag of their belongings. On Magda’s 17th birthday, June 11, 1944, the Nazis put the victims on a cattle car with 75 other people. The cable car was so crowded that Magda had to stand for almost three days consistently to allow her parents to sit on the floor. The train only had one bucket for water; it was never refilled for the rest of the trip. With only a small window to let some air in, the journey to the unknown took 3 nerve-racking days. Upon arrival, Magda was separated from her parents and was immediately given strict instructions. First, the victims were transported to an empty room where they had to completely disrobe, place their clothing on the floor (never to be seen again), and then shave their heads bald. The Nazis gave the people ill-fitting uniforms (undergarments) and took their shoes away, only to replace them with flimsy wooden sole flip-flops that were very difficult to learn how to walk in. After a few days, Magda asked the people who had been in the camps longer than her when they were going to see their parents. They pointed to five chimneys with dark, black smoke expelling out of them and said, “That is were your parents are.” These were the crematoriums where around 6 million Jews were killed. So at age 17, Magda Brown became an orphan, was evicted from her home country, and as she later learned, only 7 out of her extended family of 70 members survived. By the end of March, 1945, the U.S. Sixth Armoured Division was nearing the base at which she was stationed, so the Nazis set all the Jews on a death march. On the third day of the exhausting march on a cold, windy highway, the prisoners noticed some of the Nazi guards escaping to avoid capture by the incoming U.S. army. By this point, they were near a village/wheat field location and noticed that there was a farm nearby. Magda and a group of her fellow prisoners decided that they would make their escape in the night by crawling to the farm on their stomachs. Magda explains that her (and the rest of the groupmates’) self esteem was so low that they figured that they would die by the hands of the Nazis either way, so it was worth a shot. However, Magda was extremely fortunate as the Sixth Armoured Division of the U.S. army was approaching and managed to liberate them. Although free and full of hope, Magda still had no clue what to do next, since almost all her family had perished in the camps and she had no connections. Fortunately, in the summer of 1945, an army chaplain asked if she had any family still alive. She recalled that her father’s brother and his family had emigrated to America in 1908; however, she only knew their names and the city they lived in, Chicago. Nevertheless, she found her blood family in Chicago and emigrated there as soon as she could. After that, she quickly learned English and was recruited as a certified physician assistant for about 40 years.